Welcome! This website has been set up by Innerleithen Community Trust to allow people to explore our town's vast heritage. 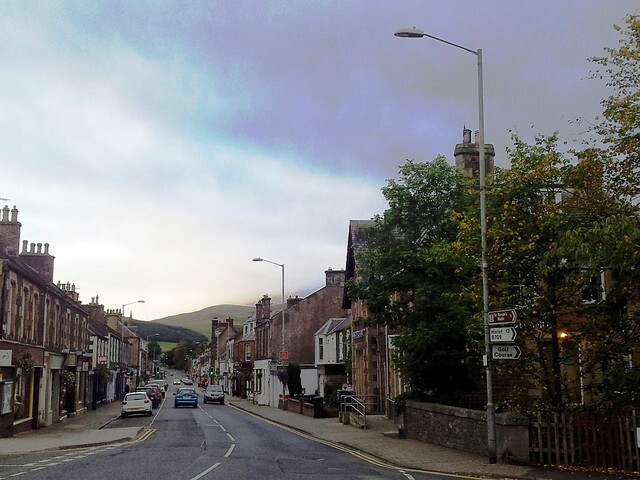 Innerleithen derives its name from its situation near the confluence of Leithen Water and the River Tweed. The Leithen was of major importance to the development of the town as a source of power and soft water for the processing of woollen textiles. 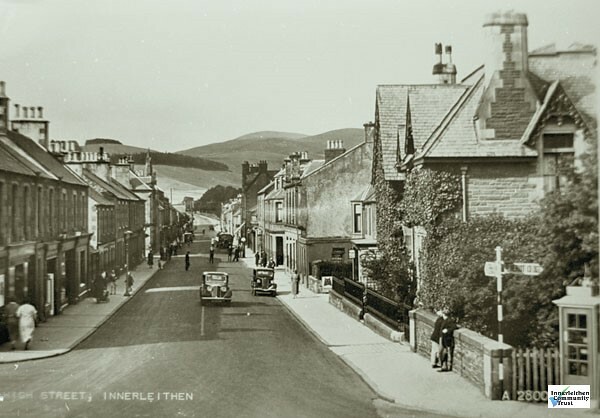 Innerleithen was also a spa and so water has played a prominent role in the town’s industrial and cultural heritage. The Iron Age forts on Pirn and Caerlee hills are evidence of settlement in the area since before Roman times, but it was the 12th century before “Inverlethane” entered the annals of recorded history. In 1159 Malcolm IV granted the church at Innerleithen the right of sanctuary as a mark of his gratitude to the villagers who had recovered the drowned body of his son from the Tweed. At that time Traquair House, reputedly the oldest inhabited house in Scotland, was a royal hunting lodge and this is where the king and his court would be staying. At the close of the 18th century Innerleithen was a small community of crofters, shepherds and weavers in cottages spread randomly between the present day Damside and Leithen Road as far as the Kirklands. At that time the hamlet’s “Doo Well” was a mineral spa of considerable reputation. After the publication of St. Ronan’s Well by Sir Walter Scott, Innerleithen became associated with the fictitious “St. Ronan’s” in the novel and visitor numbers greatly increased. The Earl of Traquair commissioned an elegant pavilion in the 1826 to create more comfortable accommodation for visitors to the spa. St. Ronan's Wells continues today as a visitor centre and garden and admission is free. In order to promote sport and to entertain the many visitors to Innerleithen in the hey-day of the spa James Hogg and others founded the St. Ronan’s Border Club in the 1820s. This led to the inaugural St. Ronan’s Border Games being held by the side of Leithen in September 1827. With the exception of years of global conflict the Games have been held annually since that date, constituting the oldest organised event of this type in Scotland. The fictional mineral well in Scott’s novel had sprung from the ground following an encounter in which St. Ronan had thrust the Devil down into hell. This tale was adapted as a pageant to be acted out by school children in 1901 and was the foundation of the Cleikum Ceremonies which has since been part of the town’s annual festival – St. Ronan’s Border Games Week. Though there is no direct historical link between him and Innerleithen the St. Ronan associated with the Cleikum Ceremonies had his church or cell on the Isle of Bute, travelled widely and died in AD 737. Like other Border towns Innerleithen enjoyed its boom years during the rise in the mill industry throughout the mid and late 1800's. Following the decline of the textile industry in the Borders all the mills bar one have been demolished to make way for modern housing, and until 2013 Caerlee Mill was famed world wide for the production of high quality cashmere garments. Part of this mill complex is the five storey block built between 1788 and 1790 by entrepreneur and philanthropist Alexander Brodie, a native of Traquair, to boost employment in the locality. The lively main street has several buildings of historic interest, including Robert Smail’s Printing Works run by the National Trust for Scotland and open to visitors. The shops and cafes are mainly locally owned and, therefore, create an interesting variety for residents and visitors alike. The neighbouring Forestry Commission Scotland woodlands and community woodlands add to the amenities around the town.